If you’re getting ready to head off to college, then you’re ready to trade in that high school backpack and get yourself one that will carry all those heavy college textbooks. Sure, the one you used in high school might still be perfectly functional, but college is a totally different experience. You won’t have a locker and you will probably need to trek across campus to get from one class to the next. And you’ll have a lot more textbooks to keep up with that you did in high school. That’s why you need a new bag and we can help you out with that. If you are shopping for backpacks for college, you may be overwhelmed by the different types of student backpacks available for purchase. Buying a college backpack is definitely easier if you know what type of backpack you are looking for. Here’s a look at the most common styles of college backpacks. The rolling backpack typically has two wheels, one on each side of the back. And there will be a handle at the top of the backpack that extends for pulling. A wheeled college backpack can be a good idea if you have to carry a lot of heavy books that will hurt your back. 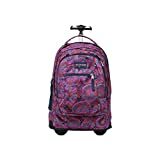 It is also a good idea to get a rolling backpack for college if you go to school on a very large campus and have to do a lot of walking to get from place to place. For example, when I attended the University of Central Florida, the parking garage where I left my car was on the complete opposite side of campus from one of my classes. 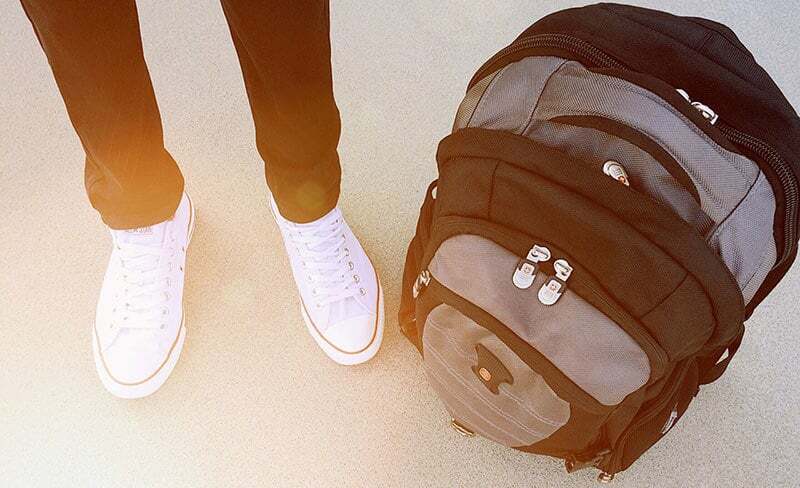 With a rolling backpack, that trek to class is a LOT easier. You just extend the handle and pull the rolling backpack along behind you. Canvas backpacks are just that – backpacks made of canvas. You can get a canvas backpack in different sizes. Typically, this style of backpack is only a good idea if you do not have a lot of heavy stuff to carry as it will not be padded at all. Another concern with a canvas backpack is the fact that it is not waterproof. If you are caught out in the rain with your canvas backpack, your textbooks can get wet. If your main objective is to get a cute backpack or an explorer style backpack, then canvas is a good choice for you. If you will be taking notes on your laptop in class, you should probably get a laptop backpack or notebook backpack. Otherwise, you’ll have a separate laptop bag from your college backpack. That’s a pain, so why do that when you can put your laptop and textbooks all in the same backpack? Laptop backpacks usually have a separate padded sleeve in the back of the main section for you to slip the laptop into. Laptop backpacks are also usually larger than other backpacks. A variety of backpack brands offer laptop computer backpacks, such as Swiss Gear, JanSport, High Sierra and Targus. This style of backpack is usually a waterproof backpack so that your laptop doesn’t get wet if you are out in the rain. Mesh backpacks are usually pretty small and feature the rope-like straps for you to wear on your shoulders. This style of backpack is not practical for carrying around textbooks. If you are an athlete, the mesh backpacks are good for carrying around a change of clothes or extra shirt in. Leather backpacks are a great choice if you are looking for a durable college backpack. You can find this style of backpack in a variety of sizes. Stop by a local Wilson’s Leather or other leather specialty store to browse your options. Messenger backpacks, which are also known as messenger bags, can be a good choice for college if you do not have a lot of heavy items to carry. Since messenger backpacks typically only go on one shoulder, it can cause a lot of back pain if the messenger bag is too heavy. Some of the newer styles of messenger backpacks do have two shoulder straps, which makes them easier to carry. You may also choose to go with a sling messenger backpack. If you are preparing to buy a college backpack, you may not know where to start this if your first time buying college backpacks. When looking for the best student backpack, you need to compare the backpacks to determine the best fit for you or your child. First, look at the student backpacks to see the various types. For instance, you may be looking for a laptop backpack and have no need for a canvas backpack or a mesh backpack for college. For details on the types and styles of college student backpacks, read our tips above. Knowing the type of backpack you need, allows you to determine what size you need. Will you be carrying around a lot of books at once? Or only a few books at a time? If your backpack is going to be heavy most of the time, you should look at backpacks that have padded shoulder straps and a padded back. This will prevent you from getting bruises and pain on your shoulders and your back from the weight of the bag. Do you need lots of little pockets on your backpack? Do you need mesh pockets on the side or a place for a water bottle on the side? Do you need a key clip on the inside of the backpack? Do you need a place for an MP3 player and the headphones to come out of? Do you need the backpack to be waterproof? Do you want a lifetime warranty? Do you want a specific color? or brand? Once you know what you are looking for, you want to read those college backpack reviews. As you read the reviews, pay attention to the advantages and disadvantages each reviewer lists. For instance, check to see if anyone has mentioned poor quality, something breaking on the backpack or how many items fit into the backpack. These are things that you can read in the reviews and help you decide between your available backpack options. When you are ready to buy a backpack for college, you may not know where to buy the college backpacks or who sells student backpacks. Finding college backpacks for sale is actually pretty easy. Getting the best price on backpacks for college can be a bit more challenging. 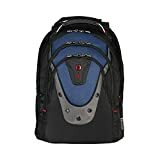 If you are not sure what type of backpack you want for college, I find it is good to check out some reviews of backpacks online. Amazon is my go-to place for the best reviews of college backpacks, but you can look anywhere you like. We also offer college backpack reviews here that may help you find an affordable student backpack that meets your needs. When buying college backpacks, you may be looking for cheap student backpacks or discounted student backpacks. 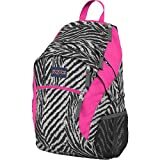 Or you may not be looking at bargain backpacks for college – instead you may just need to compare college backpacks to get the best one for you or your child. A variety of different places sell student backpacks. Places where you can buy college backpacks include Wal-Mart, Target, sporting goods stores, TJMaxx, Meijer, department stores (like Macy’s), specialty stores (like Fossil or GAP stores) and online. 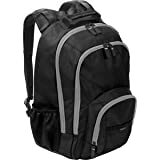 If you’re wondering where can I buy college backpacks online, the answer is at all of those places, including Amazon.com. In my experience, a lot of these offline and online stores carry a lot of the same backpacks. You just gotta do price comparisons for the college backpacks that you like to see who sells college backpacks the cheapest. Who Sells Backpacks for College Cheap? If you want to know the answer to, how do I get college backpacks cheap? – the answer is that you need to price compare the student backpacks at a few different places. Sure, it can take a little time to do price comparisons of college backpacks to see where you can get low price student backpacks under $20 or under $30 or whatever your budget is. Once you know which student backpack you want, such as a mesh backpack or a canvas backpack or a rolling backpack, and you look for what is the best price for that college backpack, I suspect you will find that the answer is thus – for a low cost college backpack, you will find that you get the best price on college backpacks online almost every time. Why are the cheapest college backpacks online? The online stores seems to discount college backpacks frequently, which immediately makes deals for student backpacks. Some stores even offer free shipping on your backpack purchase! When you compare prices for college backpacks, you need to take into account the full price – including shipping and sales tax. Personally, I like to visit a few local stores and shops to see what type of backpack interests me. I write down the names of any that I like and the price. Then I go home and jump on Amazon to read reviews and see if their price is cheaper. I suggest you take your time picking out a backpack for college because you want to pick the right one for you. You definitely don’t want to have to be buying another backpack come next semester just because you shopped a student backpack sale and took the cheapest college backpack instead of the one you really wanted. When I started college, I was looking for a cheap backpack that would last me for all four years and still be able to hold all of my books. I also didn’t want something that looked sterile and lame. I wanted a cute backpack for school. I found what I was looking for with the JanSport Classic SuperBreak Backpack. One of the great things about this backpack is the number of color options you get! There are over 35 different solid colors and patterns that you can choose from for your college backpack. Check out all of the available colors at Amazon by clicking on the image below. No matter what color you get, the JanSport backpack is made out of durable polyester. It has one main compartment, which can hold even the biggest college textbooks (like the science ones!) as well as a few other things. Then there is a smaller front pocket, which is good for things like a calculator, pencil or pen and your iPod. At least that is what I keep in the pocket. The shoulder straps are padded, which is important if you’re going to be carrying a lot of heavy textbooks. And if you have to walk far from your dorm or the parking lot to get to your class, you will really love the padded straps. This JanSport backpack has a lifetime warranty! That means that if you manage to get a rip or tear in it, or anything else, you can get it replaced for free! That goes for this backpack, the JanSport Big Student Classics Series Daypack and all other JanSport backpacks. I have to admit – the lifetime warranty was the biggest selling point for me. I didn’t want to have to pay for another backpack in a few semesters. Luckily, I never had any problems with my backpack, but if I had it would have been free to replace. If you want to get a cheap large backpack for college, you need to check out the JanSport Big Student Classics Series Daypack. This JanSport backpack series is similar to the JanSport Classic SuperBreak backpack, only it is quite a bit larger. In fact, this student backpack has two large main compartments for those super-sized college textbooks. And it also has the front pocket, which you can use for things like your cell phone, a calculator, something to write with, your keys and maybe an iPod. Like all other Jansport backpacks, this one has a lifetime warranty. So, if you get a hole in the bottom or rip a side or something like that – no worries. At any time, for any damage at all, you can send in your backpack to JanSport and have it replaced – at no cost to you! That makes this college backpack and excellent investment! If you are worried about getting back or shoulder pain from carrying around all your books, you won’t have that problem with this backpack. In fact, it has some of those S-curve ergonomic shoulder straps. Straps like this are easier on your body because they make sure the weight in the pack gets evenly distributed. How Many Textbooks Will Fit? If you are a nursing student or just have a lot of textbooks, you may need a backpack that can hold all of those books. I’ve actually seen a nursing college student fit a ton of textbooks into her backpack. You won’t believe how many books she gets in there! If you are looking for a new backpack for college, you may be looking for a specific type of backpack for school. Instead of getting a standard student backpack in solid black, you can opt for a super cute backpack. You can find a lot of cute Jansport backpacks because Jansport makes their backpacks in so many different colors. If you’re not sure where to start searching, here are some of my favorite cute college backpacks. If you are into being green and saving the environment, this environmentally-friendly Recycled Jute Rice Bag Backpack will do the trick. Not only is it super cute, but it is totally unique. You see, each backpack is made out of recycled jute rice bags, which means that no two backpacks are alike. It is truly a one-of-a-kind backpack. Even the colors vary. This backpack has a total of 3 pockets. If recycled materials are not your idea of cute, take a look at the JanSport Big Student Classics Series Daypack (see above) . Not only does this JanSport backpack have a lifetime warranty, but it comes in over 30 different color options. This student backpack has plenty of pockets and ergonomic shoulder straps for when you have to carry those heavy books all across campus. I actually think its the cutest JanSport backpack. The Hurley Honor Roll Backpack is a pretty cool college backpack. It has dual mesh pockets, skate strap detail, a music cord slit and a padded internal electronics pocket. It also comes in a variety of different color schemes. This college backpack is great for guys and girls. 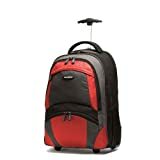 There is no doubt that the Samsonite Wheeled Computer Backpack is the best rolling backpack for sale. In fact, it is great for students of all ages. One of the things that is so great about this wheeled backpack is how durable it is. The Samsonite Wheeled Computer Backpack is made of high strength, durable 400 denier nylon. This is rip stop nylon, so you do not have to worry about this rolling laptop backpack not being tough enough for you. Laptop bag compartment: Accommodates up to 17"
The wheels on this laptop back are also pretty special – they are high quality inline skate wheels. And if you want to wear the backpack on your shoulders, the design of the placement of the wheels won’t leave you with bruises on your lower back. And padded, contoured shoulder straps keep your shoulders from getting sore. The back panel is also padded for your comfort. The backpack has a padded laptop pocket that fits up to a 15.4″ notebook computer. On the side, you’ll find a mesh water bottle holder. Inside you will find some extra organizational pockets, which are good for things like money, keys and your iPod. The High Sierra Swerve Backpack is the best student backpack if you need a lot of space and compartments. I honestly think it is one of the best backpacks for college. It features multiple compartments, mesh water bottle pockets on the sides, a padded laptop sleeve, a key fob that is removable, a media pocket for your cell phone or iPod and a headphone port for your MP3 player. This cheap and large college backpack is super durable – it’s made of 1000 denier Duralite nylon, which means that it takes a lot to get a rip or tear in the fabric. This High Sierra backpack truly makes for a comfortable day pack to carry your books and other items all over campus. If you are looking for a student backpack with plenty of storage, you really don’t need to look any further. Sure, there are some large JanSport backpacks with a lot of space too. But this backpack has a lot more compartments for storage and it holds a 15-inch laptop. You’ll even find that the straps on this backpack are strong and comfortable. The wide straps make it easy to comfortably carry the backpack around on your back. If you need a large backpack for college that will hold your laptop, check out the Targus Groove BTS 17. This backpack has a lifetime warranty, which is great if you are rough on bags. It is designed to hold a widescreen 17 inch laptop with no problems. If you are carrying your laptop and textbooks in this pack, the comfy straps have shoulder padding and will keep your back from feeling the pain. When it comes to college backpacks with a lot of space, the Targus Groove BTS leads the way. It has a lot of compartments and pockets for all of your things. You’ll also find two water bottle pockets – one on each side of this big student backpack. Load up this backpack with binders, textbooks, notebooks, your laptop, pens, pencils, your iPod, bottles of water and you’ll still have plenty of room! As you can see, this laptop backpack has a LOT of space. If you are interested in the pack but not crazy about the colors or need it to be slightly larger for a larger laptop, you are in luck. This same style of laptop backpack is available in other colors and sizes. Click above to see your other options. You may be wondering – is it worth it? Well, it depends. Tumi makes high quality items and this luxury college backpack is no exception. Not only does it look great but it has many uses. You can use it to carry your college books. You can use it for commuting on the train, you can use it when you travel or when you go to work. If you want a non-traditional college backpack that will hold a laptop, check out the Thule Crossover TCSP-1 Laptop Sling backpack . This college sling backpack is a high quality laptop backpack for school. It is not bulky or too big, which makes it best for students that do not need to carry a lot of books at once. Marketed to guys, this is one of those cute college backpacks for guys. And it looks great on. Of course, girls can carry this college backpack too. Don’t let the boys have all the cute college backpacks! I love that this backpack is padded. So many college backpacks overlook this and you end up with back pain from carrying heavy books around campus. This sling backpack for college also has lots of pockets and compartments for you. There is a dedicated water bottle pocket. And a small pocket that is perfect for your iPhone, iPod or other small items. It holds up to a 15.4-inch laptop in this laptop college backpack. If you want a sling should backpack for college, this is an excellent choice. The bag is lightweight but super durable at the same time. If you’re looking for a cheap mesh backpack for college that won’t rip or tear the first time you use it, the JanSport mesh backpack is the best choice. As you can see from the image, the backpack is completely see-through, which means it is not the most secure backpack. It actually comes in several different color options (click below to see all color choices). THE MESH PACK BACKPACK: The clear JanSport Mesh Pack keeps everything in sight. Whether it's for everyday, travel, work or school, the clear mesh makes it easy to find things, while the front zipper pocket and inner hanging pocket help you stay organized. YOUR EVERYDAY, EVERYWHERE BACKPACK: JanSport backpacks are popular for a reason. With colors & style that reflect your personality, room for books, water bottles, laptops & sports gear, your JanSport goes from serious to fun as quickly as you do. JANSPORT BACKPACKS: JanSport backpacks are made with durable fabric, zippers & straps, in colors & designs to reflect your style. We stand by our packs for a lifetime, so carry your JanSport on your adventures. WE'RE ABOUT THE JOURNEY: JanSport is about the discovery of fun, freedom & adventure. From your first school backpack & lunch bag to the bag you bring to your first interview, from running errands to chasing dreams, JanSport gear inspires your journey. On this backpack, the only padding you get is from the shoulder straps. The pack has one main compartment, but it is a very large compartment. There is also a fairly large zippered pouch in the front of the student backpack. Got a lot of heavy book-hauling to do this fall at school? Need a sturdy backpack that can hold all of your textbooks that you don’t have to carry? If you have a heavy course load at college, you should consider one of JanSport’s rolling backpacks for your college backpack. JanSport’s wheeled backpacks feature built-in wheels and handles that make getting to class less back-breaking. If you need a backpack to keep things separate, The JanSport Driver 8 Wheeled Backpack may be the pack for you. The JanSport Driver sports two large interior compartments for books, folders and other class necessities, as well as a separate padded section for a laptop up to 15.1 inches. Additional features include two smaller front pockets for little items and water bottle storage. When not in use, the shoulder straps of the Driver 8 Wheeled Backpack are stored in a pocket on the back of the pack, and the pull handle on the back also retracts when not being used. Get plenty of space for textbooks and class necessities with the JanSport Superbreak Wheeled Daypack. Crafted out of polyester and featuring one main compartment, the JanSport Superbreak wheeled backpack also has an additional on the pocket on the front for smaller items. The rubber handle on the JanSport Superbreak Wheeled Daypack extends to three different lengths and the backpack straps tuck into a back pocket when not in use. Built-in skid rails on the sides of the pack and corner guards make the Superbreak ideal as a wheeled travel backpack. Though the JanSport Superbreak may be a large backpack for college, if you play a sport or travel, this pack might meet your needs better than a smaller pack. If you are looking for a smaller rolling backpack for college or for travel, consider the JanSport Rolling Carry-On Brief Case. The JanSport Rolling Carry-On Brief Case doesn’t provide the amount of space offered by other JanSport rolling backpacks, but it provides separate compartments for a laptop, tablets and folders and other course-related materials. If you don’t need to carry all your text books at once, the JanSport Rolling Carry-On Brief Case may be all the space you need. Like the JanSport Superbreak Wheeled Daypack or Backpack, the JanSport SuperBreak Rolling and JanSport Antics Wheeled Duffels are large packs that have larger interior compartments than a standard college backpack, providing an ample amount of space for sporting equipment or travel gear. Both the JanSport SuperBreak Rolling Duffel and the JanSport Antics Wheeled Duffel are top-loading packs with a larger opening than standard backpacks. Both packs also have built-in skid rails and corner guards for protection during travel. If you need to buy a large college backpack at a low price, you can’t do any better than the JanSport Wasabi backpack. Seriously, this backpack can hold loads of stuff because it is one big college backpack. What can you put in it? Try an iPad, a laptop, two binders, one hardback textbook, two paperback textbooks, four notebooks, a calculator, a cell phone, some pens, a bottle of water and an umbrella – with some room leftover! This backpack has some serious capacity for carrying large loads around campus. And you don’t have to worry about killing your back when you are carrying around this backpack. It has a super padded back panel and the ergonomic straps are also padded. That means this backpack knows you’ll be carrying heavy loads. It makes it a comfortable pack for carrying your textbooks and such for school. I also love the color options you can get this backpack in. I make no secret of the fact that I love buying JanSport backpacks. And for good reason. Every JanSport bag comes with a lifetime warranty and that means a lot. Say you are carrying around a bunch of books and you get a rip in the bag. No problem, you get it replaced for free. What if you get it caught on your chair in class and it rips the side? Replaced for free. I love this brand so much that I own more than one backpack from JanSport. In fact, I started buying them when I was in middle school. Only once I have had to use the warranty and it was a breeze. Even if you end up buying one of the more expensive JanSport packs, you end up saving in the long run since you never have to buy another pack again – unless you are like me and have a weakness for cool packs. If you are checking out the various types of college backpacks to buy, be sure to put this brand on your list. If you have an excessive amount of textbooks to carry around campus or you have back problems, buying a wheeled backpack for college may be the best option for you. Finding a good wheeled backpack can be a challenge. The amount of space in the pack varies because it has to house the handle in the back. On a related note, the back of the wheeled backpacks are not always comfortable to wear, should you choose to wear it on your back. And if you are carrying around a lot of heavy books, and of course you would be, you need to worry about the handle being study enough. Or, the wheels may be too large and stick out to the point of being uncomfortable when you are wearing the pack. A few years ago I had a cute little rolling backpack that I just loved. That is until the handle broke on my way to Chemistry class when the pack was full of heavy science and literature books. Apparently they were just too heavy. And I quickly learned that my pack was going to kill me if I had to wear it on my back. That’s how I know what is important to look for on a rolling backpack – I had to learn the lesson the hard way. My favorite thing about this backpack is the wheels. They are inline wheels, just like you will see on roller blades. That means that this rolling backpack is easy to maneuver. Nothing is worse than pulling a heavy backpack behind you only to have it tip over when you round a corner. It has a padded laptop sleeve that actually holds up to a 17-inch laptop. That is pretty sweet for people that have a larger laptop. The main compartment is super big and you really need a large backpack for college for all those supersize textbooks. The shoulder straps and the back pf the pack are padded so that you won’t be in pain if you decide to wear it. It’s got some nice front compartments. I like using the top one for my keys, my cell phone, some pens and gum. In the lower pocket I have a little notepad, my iPod and a few other random things that are too big for the smaller pocket. It comes with a five year warranty. That’s not as good as the lifetime warranty from JanSport, but it is still better than nothing. Only thing I have to complain about is that I wish there were more color options available with this one. If you need a large college backpack that is both sporty and trendy, the High Sierra Loop backpack is a good choice for you. The best thing about this big backpack is the number of compartments that it has for holding all your stuff. You get two side beverage pockets, which is great if you take this bag out hiking with you. Or if you have a really long day of classes, like all Tuesday/Thursday classes. The front features a zippered pocket for a CD/MP3 player with headphone port. There is also a hanging accessory pocket and places for pens and other small items. This is great for your keys, ID and cash. The backpack has a large main compartment as well as a slimmer full-size compartment in front of that. And if you still have more stuff, you can use the monster hook with bottom straps for carrying around more gear. The shoulder straps are yoke-style, S-shaped and great for your back, even when you are carrying a heavy load. The straps have thumb ring adjuster pulls and a cell phone pocket. They also feature ventilated Vapel mesh, which helps to keep you cool, and a suspension strap, which takes the pressure off your back when carrying a heavy load in the bag. This bag is perfect for a hiking daypack as well as a college backpack. It’s just a great general use bag. Made with 600-denier Duralite, it is super durable no matter what you plan to use it for. As you can see from the image, you can get this backpack in some standard, solid colors. But you can also buy it in some pretty colorful designs. Thirteen different color choices are available, including a purple flowers design and a blue lightning bolts design. Designs and colors are available for guys and girls. Do you need a roomy backpack for college that a dedicated space for your laptop but will not break your back with the weight of carrying everything around campus? If so, you need to check out the JanSport Driver 8 Core Series Wheeled Daypack. This durable rolling JanSport backpack is consistently on the list of the top selling backpacks for 2017 and the top rated wheeled backpack by our editors. And for good reason. This large JanSport pack can hold a LOT of stuff and you don’t have to worry about sore shoulders or an achy back because you can wheel it along behind you as you walk. Sure, it has straps for those times that you want to carry it on your back, but you don’t have to do that. The best thing about this backpack is its size. It has two large main compartments and an extra compartment that has a padded sleeve for a laptop. You can fit up to a 15.1-inch laptop in the space. On the front of this rolling JanSport backpack, you will find a zippered compartment that can help you keep loose, small things organized. It is perfect for pens, small notebooks, your cell phone, your MP3 player, your keys and anything else small. And the side has a water bottle pocket. This is one of the most durable and sturdy of the wheeled college backpacks that are available for purchase. The wheels are mounted on the side, which helps prevent it from tipping over when you are pulling it behind you. And the wheels are the same type found on roller blades, so they are very high quality. The handle is T-shaped, which makes it easy to grasp and hard to break. But even if you do manage to break it – the pack has a lifetime warranty. And that is a good thing if you plan on pulling a heavy load of textbooks or other items with this backpack. If you need a college backpack that has space for your laptop computer, then you need to check out the Swiss Gear Ibex 17-Inch Notebook Backpack. This computer backpack is consistently a top seller among the laptop backpacks. The great thing about it is that you can fit up to a 17-inch laptop in the bag. This padded compartment helps keep your computer safe as you carry around your textbooks and other things. One of the benefits this backpack has over others is that air-flow padding on the back, which is great for keeping you cool. You see, it works to keep your back from getting warm while you are carrying around the backpack, even in the summer. It also has should straps that are shock absorbing, which is great for your comfort. This large backpack has plenty of compartments for all of your stuff. It even has a gadget pocket for your iPod or cell phone. The bottom of this backpack is made out of extra durable material, which means you do not have to worry about it breaking if you carry around a lot of heavy textbooks. One of the best features is that the bottom is waterproof. This is important because it means you can sit it down on wet pavement or something and not have to worry about the items in your backpack getting wet. Overall, this pack is much better than the popular Columbia Cyberpack. Finding the right laptop backpack can sometimes be a challenge because they all seem to look the same for the most part. If you have done any shopping for a laptop backpack then you already know that most them are only available in black or gray with no real color options. Another characteristic that they all seem to have in common is that they are huge in size. I am not sure why the backpack makers think that if you want to carry around a laptop that you also need space for every other thing that you own. Fortunately, the JanSport Right Pack laptop backpack overcomes these characteristics to offer a refreshingly different choice amongst the sea of like backpacks. As you can imagine, one of the best features of this cheap JanSport laptop backpack is that it can hold a 15″ laptop. It is also perfect for a table or iPad. Another obviously awesome feature is the low price, which is considerably lower than many of the other backpack options out there. And of course, it is large without being too big. It has a main compartment as well as a smaller pocket for all the things that you might have a hard time finding in the main compartment. The smaller pocket is great for keys, cell phone and other small items. The bottom of this backpack is made of durable suede, which means you do not need to worry about this backpack getting any stress tears in the bottom. And the rest is made from premium Cordura fabric for superior durability. Not that it matters, because you get the awesome JanSport lifetime warranty with this backpack. If you are looking for a kickass college backpack that has plenty of room for all your books and gadgets – but has a decent price – then look no further than this backpack from High Sierra. A fully padded CushionZone laptop compartment accommodates most 17-inch models. A dedicated TechSpot sleeve provides an ideal space for your tablet. The rain cover is stored in a hidden compartment at the bottom of the bag. It is perfect for keep your contents dry and help keep the bag clean when checked during air travel. Moisture wicking Vapel mesh material and deep air channels create maximum airflow between your back and the pack. Seriously. This is one awesome backpack because it has loads of room – including space for a 17-inch laptop – and it looks cool. You do not need to worry about only having one or two color choices with this pack. There are options for both guys and girls, making this unisex college backpack perfect for everyone! One thing to know about this backpack is that it was designed with the college student in mind. They know that you need a lot of space for textbooks and that you likely will want to carry your laptop to class. They also made dedicated space for your iPhone and other gadgets. Oh, and they know that you might get rained on when walking to and from class – so this backpack has a tuck-away rain cover! How freaking awesome is that?!? You won’t have to worry about your books and laptop getting wet when you get caught in the rain. In addition to having tons of compartments for all your stuff, this backpack is also easy on your body. It features S-shaped shoulder straps with Vapel mesh Airflow padding to keep you pain free and sweat free when going back and forth across campus. And – it has a lifetime warranty! For college students enrolled in a photography course, the need for a backpack is a bit more complex. Not just any backpack will do for transporting a DSLR camera, its lenses and other equipment. You just never know when you will be out in the rain or when the bag will get roughed up. That is why the AmazonBasics Backpack for SLR Cameras and Accessories is the perfect choice. This super sturdy DSLR camera backpack almost seems as if it was designed with college students in mind. It is super cheap. It is super durable. And it is surprisingly high quality considering the low price. In fact, it is one of the highest quality camera backpacks on the market. The important thing to note about this photography backpacks is that it is designed to hold two DSLR camera bodies and lenses all inside the backpack. There you will find different padded compartments that you can change to fit all your gear. Straps on the outside will hold your tripod. And for everything else? There are two large zippered pockets, two small pockets and a bungee cord. You don’t even have to worry about getting a sore back or shoulders because the straps are padded. Plus, the exterior protects all your gear from water damage if you happen to get caught out in the rain. If you are shopping for a backpack for college, one of the best brands for the money is JanSport. I’m a huge fan of JanSport because they make high quality packs and all of them come with a lifetime warranty. If you are trying to decide on the best JanSport for you, it may come down to these two popular styles. They are actually pretty similar to each each other. Here’s a look at the advantages and disadvantages of each. This is the cheaper of the two backpacks. You get just over 35 different choices for color or designs. The backpack has one main compartment and one big pocket on the front. 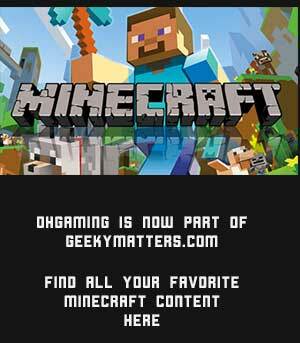 See our full review above. On average, this backpack is around $8 more in price. It also offers just over 35 different color or design choices. It is the bigger of the two backpacks and features two main compartments and a big pocket on the front. See our full review above. As you can see, the two backpacks have a lot in common. Personally, I think the JanSport Big Student Classics Series Backpack is the best choice. Even though it has a slightly higher price, it does have a lot more space. As a college student, that space is necessary. If price and name brands are important to you, then Ross is a good place for you to go shopping for your college backpack. If you have never been to a Ross store before, they are very similar to a TJMaxx. At Ross, you will different inventory and different brands from week to week. During the busy season, you may even see different inventory from day to day. One of the great things about doing your backpack shopping at Ross is that you are not going to be paying retail prices. Every single thing that is being sold at Ross is listed at a price well below the retail price. Often they even leave the original tag on the item so you can see what an amazing deal you are getting. Another great thing about buying a backpack from Ross is that you have a pretty good change at getting a name brand bag. Of course, you have no way of knowing which brand that might be. It could be Adidas, it could be Swiss Gear or even JanSport. You never know. A big disadvantage is that you never know what you will have to choose from until you get there. You may have your heart set on a Hello Kitty backpack but only find camo-design JanSport. It is really just luck of the draw when it comes to shopping at Ross. You also never know the size of the backpacks that will be available. They may all be large backpacks with a laptop compartment. Or, they may all be toddler size backpacks. An important thing to remember when shopping for a backpack at Ross is that the inventory varies from store to store. So, if you can’t find what you’re looking for at your local Ross, try visiting another location in your area. Luckily, you can exchange and return items at Ross, so if you find something better at another location after buying something at the first one – you have no worries about returning the original purchase. Going shopping for college backpacks at TJ Maxx is a good choice if you are on a budget and do not have a specific style or brand of backpack that you want to buy. You will find that buying a backpack from TJ Maxx is similar to backpack shopping at Ross. TJ Maxx is also a discount retailer that sell name brand items and discount prices. Usually they get limited stock of different items each week, which means if you see something you want that you should buy it when you see it. Otherwise, it might not be there when you come back for it. You can get all sorts of name brands at TJ Maxx, like Swiss Gear backpacks, at prices way below retail. Most of the time you can even see the original retail price tag still on the item, which lets you know just how much you are saving. If it is not there, the TJ Maxx price tag usually tells you an amount that is the average retail price. When you are school backpack shopping at TJ Maxx try to remember that they may not have the perfect bag that you have in mind. However, you will be able to get a great deal on the backpacks that they do carry. Of course, there is no guarantee of quality. I suggest taking your phone in with you so that you can look up reviews online before you buy your backpack from TJ Maxx.